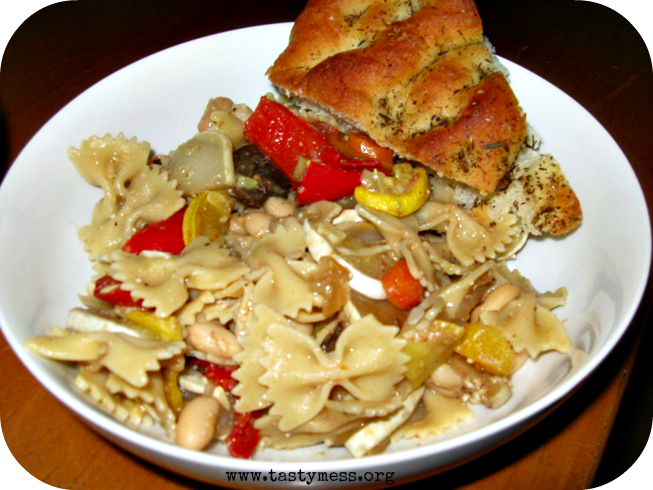 This week's throwback recipe is for a roasted veggie pasta dish I first put together back in 2011. It's the perfect way to enjoy pasta in the spring and summer without feeling weighed down by a heavy sauce. Roasting the veggies is really key to developing great flavor in the dish and you can really swap in any seasonal veggies you like! Preheat the oven to 450 degrees. Toss all the veggies (except the sundried tomatoes and cannellini beans) with the olive oil, salt and pepper and a generous pinch of the dried herbs. Spread them out on foil-lined baking sheets and pop them in the oven to roast. Cook for 10 minutes, then stir, then cook for another 10 before removing from oven. While the veggies are roasting, cook up the pasta according to the package directions. Reserve about a cup of the pasta water, drain the pasta and toss with the sundried tomatoes and cannellini beans. Add in the rest of the veggies and toss well. Add in the pasta water (as much as needed to loosen the mixture) and the Parmesan cheese, sprinkle with salt and pepper to taste and serve right away.